Angiotensin-converting enzyme inhibitors (ACE inhibitors) like lisinopril, captopril, and enalapril are antihypertensive medications. ACE inhibitors are effective at lowering blood pressure and often preferred to other options like beta-blockers (think propanolol). Nevertheless, some people on ACE inhibitors develop an annoying dry cough or allergic-reaction-type swelling of the face, mouth, and tongue (angioedema) which makes taking these medications difficult or even deadly. ACE inhibitors block the angiotensin-converting enzyme which converts angiotensin I to angiotensin II. By blocking this necessary step in the renin-angiotensin system, ACE inhibitors are able to decrease blood pressure via vasoconstriction and impairment of aldosterone activity. Aldosterone is a steroid hormone (mineralocorticoid) produced by the adrenal glands (zona glomerulosa), which sit atop your kidneys. Aldosterone regulates filtration of urine by the kidney's nephrons. Specifically, aldosterone works to bring sodium and water into your circulation in exchange for potassium which is excreted and urinated out. Of note, as dictated by the laws of osmosis, retained sodium and water increase blood pressure. ACE inhibitors like lisinopril are used to treat hypertension or high blood pressure and are particularly effective in those people with chronic kidney disease and heart failure. ACE inhibitors are also used in the treatment of stroke, heart attack, heart failure and prevent future cardiovascular events. It should be noted that in a general sense, ACE inhibitors—like some other antihypertensive medications—are less effective at lowering blood pressure and preventing further stroke and heart attack in African Americans. In those with impaired renal function or in those also taking NSAIDs (drugs like aspirin), ACE inhibitors can also derange levels of your body salts which results in hyperkalemia or excessive potassium levels. Hyperkalemia is bad because it messes up your heartbeat and can kill you. After immediate discontinuation of the ACE inhibitor, such hyperkalemia is treated in the hospital using drugs like calcium, insulin plus glucose and so forth. Under normal circumstances, the angiotensin-converting enzyme breaks down bradykinin, an inflammatory mediator thought to be the cause of a dry cough and swelling seen in about 25 percent of those taking lisinopril and other ACE inhibitors. Such reactions are more prevalent in African American people. In those who develop angioedema, an allergic-type reaction, the ACE inhibitor is immediately discontinued and steroids and diphenhydramine (Benadryl) are given to control swelling. Such swelling can be a medical emergency because it can block off your airway and can occur any time while on ACE inhibitors. In other words, you could be taking ACE inhibitors for some time before you experience angioedema. A cough caused by ACE inhibitors requires no treatment other than discontinuation of the drug. ACE inhibitors have a very short half-life and low volume of distribution and should wash out of you within a day. 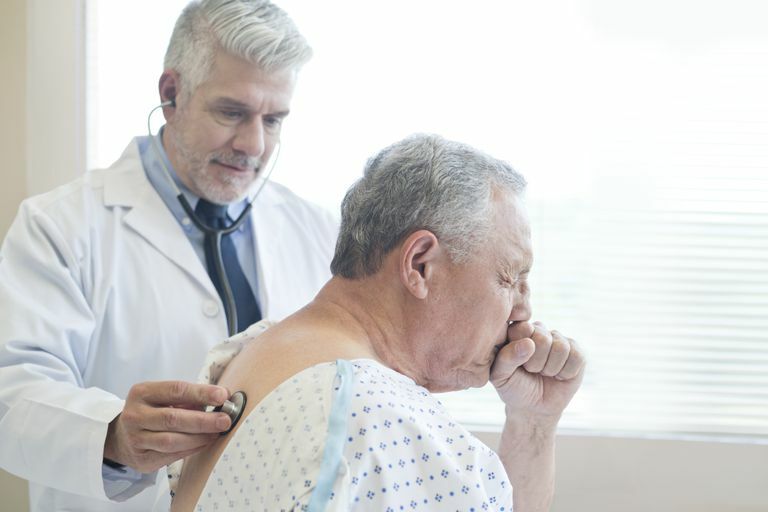 If you or a loved one are taking an ACE inhibitor like lisinopril and experiencing cough, please make time to see your physician for evaluation. Your physician will likely discontinue the ACE inhibitor and start you on another antihypertensive medication like an ARB (angiotensin II receptor blocker). If you or a loved one experience angioedema and life-threatening swelling while on an ACE inhibitor, don't take any more medication and immediately call 911. After treatment with steroids and Benadryl, your physician can evaluate you and prescribe you another drug for hypertension. Please note that this drug probably won't be an ARB because ARBs have been known to rarely cause angioedema, too. On a final note, other adverse reactions attributable to ACE inhibitors like dangerously low blood pressure and metabolic derangement (hyperkalemia) are usually caused by overdose, medication (NSAID) interactions or severely impaired kidney function which alters clearance. Thus, while taking ACE inhibitors, make sure to regularly monitor your blood pressure, follow-up with your physician and contact your physician if you ever feel nauseated, light-headed, dizzy or so forth. Atkins G, Rahman M, Wright JT, Jr. Chapter 70. Diagnosis and Treatment of Hypertension. In: Fuster V, Walsh RA, Harrington RA. eds. Hurst's The Heart, 13e. New York, NY: McGraw-Hill; 2011. Hayashi SA. Chapter 10. Angiotensin Blockers and ACE Inhibitors. In: Olson KR. eds. Poisoning & Drug Overdose, 6e. New York, NY: McGraw-Hill; 2012.